Home / Backpacking Skills / Advanced Backpacking Skills / Can You Use a Three-Season Tent in Winter? Can You Use a Three-Season Tent in Winter? 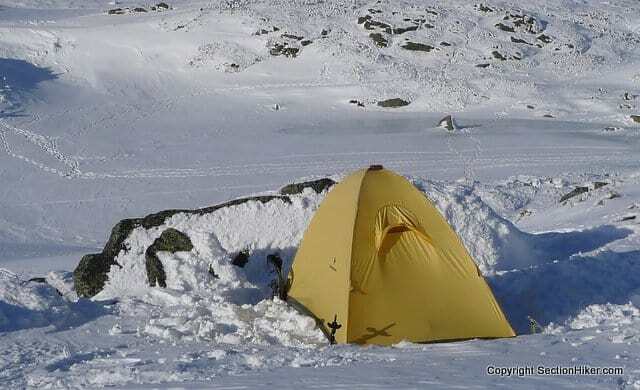 It is often possible to use a three-season tent or shelter in winter conditions as long as it provides you with good wind protection and it has steep walls to shed snow. There’s no need to go out and buy a bomber winter tent, especially if you’re only going to use it once or twice each winter. I wouldn’t recommend you use a system like this for above treeline camping, but below treeline where there is better wind protection, a setup like this will usually work provided that you give yourself adequate time to stamp out a pitch in the snow and find a more protected site. In winter, you need a tent that’s going to protect you from drafts which can reduce the thermal efficiency of your sleeping bag. To prevent this, you want a tent with solid walls (like the Black Diamond Firstlight) or a double-walled tent where the fly covers all of the mesh in the inner tent and almost touches the ground (like the Nemo Obi 1 shown, above). Ideally, the inner tent will have a very high-walled bathtub floor, with solid fabric running half-way up the side of the tent to prevent wind from blowing under the fly and onto you. Most winter tents have steep-sided walls that are designed to shed heavy nighttime snowfall so it doesn’t crush the tent or they have a geodesic shape which is very strong and can withstand heavy snow loads. We don’t normally get unexpectedly large amounts of snowfall in the White Mountains, although there will be 1 or 2 storms per year that generate a foot or more. Still, having a tent or shelter with steep walls means you won’t have to get up at night to shake the snow off your tent and it won’t fall on you when you open your front door in the morning. If you are planning on buying a three-season tent that you might also use in winter conditions, here are a few additional features you should consider before making a purchase. Vestibules: Moisture management is a huge problem in winter and you want to try to keep as much snow out of your tent as possible to prevent it from melting and condensing on the walls. If you have a tent with a vestibule, that’s built into the fly, or even better can be added in winter, it gives you a place to stash your snow-covered gear, take off your boots without tracking snow into the tent, and even cook in (with proper ventilation), if the weather is bad. Extra tie-downs: Many tents come with extra loops on the outer fly that can be staked out to provide additional anchor points in high winds. These tie-outs can also be useful to counter wind deformation of the tent’s outer skin in extreme conditions and provide better comfort in bad weather. Top vents or windows: It helps to have some ventilation in winter so that moisture, particularly from your breath, can be vented so it doesn’t freeze on the inside walls of your tent. Top vents or even a small zippered back window, like the one in the Black Diamond Firstlight tent, can really help prevent moisture build-up at night. Just to reiterate my points above, many 3 season tents can be adequate for winter backpacking and camping as long as you camp below treeline in more protected locations. As always, good campsite selection skills are necessary. I would not recommend using the same setup for above treeline camping like the kind you see in Everest high camps. That’s a different kettle of fish entirely. Philip, what do you think of the Nemo Losi 3P for Winter? The inner wall has a bathtub floor, but otherwise mostly mesh; the fly comes down pretty far. I’m writing a proposal to float an idea to think about considering the possibility of Winter camping. I still need at least a warmer sleeping bag, and you may as well bind and gag me as put me in a mummy bag — so bag & tent seem to be the two biggest considerations. Will be day-hiking all Winter, and hoping for big snow so I can use my MSR Lightning Ascents more this year. Already a little unexpected snow & ice on the AT in PA this past Sunday. So, so. The low walls don’t provide much wind protection and the thing is enormously heavy. Still it has a geodesic shape and rigid pole structure. My guess is the the vestibule is rather small. I’d keep looking. Stamping out a tent platform in snow or building a low wall around the tent could help with the wind issue from the sides of the tent walls. What about using a double wall tent in fastpitch mode, where it is just the footprint and rainfly, freestanding essentially? This would mimic a single wall tent, still allow ventilation (if the fly has it) and would not be as confining inside (use a tarp to add a little more ground protection since the footprints are small if you wanna keep off the snow). My biggest concern/question has always been if the lighter weight material, seams, and stitching will hold up in the frigid temperatures, as it gets more rigid and less pliable. Any thoughts on durability of 3-season tents in low temps? I want to qualify my remarks here. This is advice for New Hampshire, not Denali. We never camp above treeline. I wouldn’t recommend using a 3 season tent in those conditions. The fast pitch option on most commercial 3season tents should be avoided. Too much airflow. In addition to cooling you, it will catch the wind and send you aloft like Mary poppins or the flying nun. Commercial tents made by mainstream companies are overbuilt to take the abuse of American consumers. Still, YMMV if you buy a crappy tent at Walmart. Stick to Big Agnes or MSR and you’ll be fine. So true about the treeline Philip. Its a whole different world. Tim, this is what I did last winter with my Big Agnes Jackrabbit 2 on a two occasions. Each time, I was in temperatures around 5 degrees in a 15 degree bag. (I sleep warm, so I’m usually pretty cozy 10 degrees below the rating if I double up my base layer.) Each time, it was fairly windy, gusting up to about 40 mph, and I had the tent didn’t have any stability issues. I think had the winds been sustained at 40 mph or gusted much higher, I may have had a problem. The high winds and open bottom kept condensation under control, so I had no problems there. A friend who was with me on one of the two outings was annoyed by the draft. In the USA most outer tents do not pitch to the ground. So, an outer-only pitch is a huge problem for them. Notwithstanding snow, you will get dirt/debris blown into the living space, as the fly is 3-4 inches off the ground. And the negative pressure gradients will cause the shelter to be useless in trapping some semblance of warmer air in the shelter. Even if you have a full-pitch outer, or you make one by pitching it low, you then typically won’t have a weather-proff venting system, and still will need to use a heavier-weight groundcloth. A piece of Tyvek or even 1200mm silnylon is not appropriate in winter. The former will freeze to snow (awkward, and a mess to pack), and SUL silnylons are subject to damage from debris (eg, small rocks and roots) that punch a hole or begin an abrasion process. These issues are most pronounced around 32 degrees, and below treeline. Above treeline you need significant weather protection (ie, from wind), and even a robust shelter will be pushed to the limits without careful sight selection and approprate technique. I like the general theme of this. Under many conditions, a good three-season can be used in winter. I would add one more consideration – pole construction. Fiberglass becomes brittle in the cold and can fail under a snow load. Winter tents usually use aluminum poles that go through sleeves. Fiberglass poles are often attached with clips. Mark – I don’t think I’ve ever encountered a tent that uses fiberglass poles – only aluminum or carbon fiber (but rarely) But I defer to your experience. Your previously mentioned crappy Walmart tent will come with fiberglas poles. Philip, what are your feelings towards my Hille Soulo & Tarra? Do you think I will be okay on my winter solo trips? Nice write up and solid advice as always. Hille tents – a feeling of lust. Not in the White’s but across the Valley from the Whites up in the Bishop Basin. We have used my old venerable Eureka! Timberline on four December trips to Blue Lake which sits at 10,300 ft. Which I see is now rated at 3.5 Season. On two of the trips we received snow accumulations of 3 inches and 7 inches of powdery, not wet, but dry snow. The Frame of the Timberline bowed a tiny bit with the 7 inches but held up without a problem. We brought the Vestibules which worked OK but I felt very unsafe cooking under it with the old SVEA 123R so we spread a Tarp above us and keeping us out of the wind, but felt comfortable using a Snowpeak cannister stove. We also brought along the small 6 inch wide Coleman Tent heater which also uses a cannister for fuel but did not feel safe using inside the tent for it heated up the tent to quickly we felt and worried about melting fabric if we kept it turned on for any length of time. It did work well under the Tarps. In the Mojave Desert in the Winter,,not a problem, in fact it was great to get out of the winter wind and into the tent. We did use two of the UNCO Tea light Candles and they worked rather nicely, even warmed up the tent a bit but not so you could get out of your sleeping bag and sit on the bag in your long johns to play a couple of hands of poker when the temperature outside was at 28 degrees…Hope this helps. Oh, forgot, Condesation did freeze to the outside underside fly but the Sun melted it off in no time come morning. And this was the old two door style of the Timberline bought about 1981? But I had it out a few weeks ago and it is still in very good condition..Cost $76.00 back then. eddie- I used a Eureka Mountain Pass(xte 2 & 3) a few times in the winter. When I bought them they were rated as a 3 season rig but was definitely a 3.5 as far as I was concerned. Heavy but a solid tent for the price. I had 2 of them as previously stated. I don’t think Eureka gets enough consideration anymore with all of the other manufacturers out there. Leaving the top of the door open helps ventilation. Be sure to connect the fly to the tent/tent poles. A snow wall about a foot away from the tent can help prevent snow from blowing under the fly and through the screen. You tend to get more condensation forming on your sleeping bag than on the walls so you need to let the bag sit in the sun if possible. If you get stuck in a big snow storm, set your alarm and sweep off the snow accumulation in the middle of the night. FYI Oookworks and Bearpaw Wilderness Designs make inners for the SL3, which can be made of full or partial ripstop nylon and which are lighter than the Golite stock mesh inner, turning the SL3 into a full double wall tent. what about an a frame tarp over the top of the tent? this might help shed snow. You mentioned the REI quarter dome T1. I live in MI and own the quarter dome T2 plus and have an interest in winrer backpacking. With a footprint (or tarp underneath) would the Q Dome T2 plus sufffice for mild conditions in MI for winter backpacking ? Maybe a 3 day trip ? So in theory in mild conditions and an adequete sleeping pad/bag combo the rei quarter dome should be ok ? Below tree line, could a gore-tex bivy sack, 4-inch insulated sleeping pad and zero-degree-rated down bag suffice, supposing temp is no lower than 10 F, and wind no more than 20 mph? And that a camp area has been stamped out in the snow? Just wondering if better than a tent. Thanks. You’ll be MUCH more comfortable in a tent. A winter bivy is really unpleasant and your sleeping bag will get quite wet with internal condensation. Thank you very much. I was going to try it out, just in my woodsy backyard, but I am certainly reconsidering and will probably opt for the tent. Much appreciated. With the low solid walls would it be suitable for any winter camping? And is snow the only difference between 3 and 4 season camping? Basically if I camped somewhere without any snow forecasted would that make the Passage 2 any better? Should be fine, but test in your backyard first. The one issue you may have is with staking out the vestibule. The ground is very hard when frozen and driving stakes into it is beyond difficult. I have a two person tent in which I was pretty cold at 32 degrees. I have replaced my sleeping bag and air mattress etc, and because I will be backpacking I need a lighter tent. I am trying to figure out if I am able to warm up a two person tent with my body just as much as a one person tent. I will probably try winter camping once this year with some experienced backpackers. Should I go 1 or 2 person double walled tent? I love the space of the 2 person. It’s unlikely that your body heat will heat up a tent in winter since the walls have no insulation. Id stick with whatever size makes you happy. Thanks! Guess that makes sense ? Do you have any favorite 2016 2 person backpacking tents? This sounds like what you’re looking for. It’s freestanding which is a really big plus in winter, on snow. Thanks! I have looked at this many times, good advice. Hi! I bought myself my first tent, the Cinch! 3 man pop up tent for my Summer and desert camping. I was thinking since it is supposed to be double walled to reduce condensation it might be sturdy if I staked it enough to reduce the chance of wind blowing it away and put an A-frame style tarp above it then it might work well for some snow camping with good tree cover like you mentioned. Do you think it could be made to work or should I just stick with borrowing a Coleman from my parents for camping in the North East or Canada? I’m sure you’ll be fine as long as it doesn’t snow. Those popup tents usually have fiberglass poles which are quite brittle and easy to break under load. Getting a tent with aluminum poles would be preferred though. Do you think the Marmot Tungsten 1P would be an okay option, since it is meant to be durable? Or would you recommend the REI Quarter Dome over it? I’m purchasing a new tent for solo backpacking and plan to camp in Big Bend, Texas and really want to do “easy-level” winter camping in Colorado. My goal is to eventually do the Haute Route when I’m more experienced (naturally I will have to buy another tent). You’ll have to ask someone with more local knowledge about the snow loads at the elevations and location you plan to camp in.